It's a tidbit of a news flash, easily overlooked, but it affects you and your finances more than we care to admit. The National Oceanic and Atmospheric Administration, overseer and official protector of endangered salmon, on Thursday granted Washington, Oregon and Idaho "lethal removal authority" over voracious California sea lions camped far up the Columbia at Bonneville Dam. In other words, the states can kill them. And how do sea lions and the coming application of lethal persuasion affect you? If you pay your electricity bill something like a quarter of it is invested in efforts to help Columbia River salmon survive and multiply. Collectively we invest hundreds of millions a year in the effort, billions and billions over the years. The goal of all this is to have many healthy salmon return to the Columbia after their harrowing years at sea, swim upriver, do what they are meant to do, and produce thousands of offspring, each. Now, just as these precious fish are about to realize their life's goal, thousands are eaten by merciless, fur-bearing predators. The sea lions, relatively recent arrivals, are unnaturally effective in their hunt, taking advantage of the salmon traffic backup at the entrance to Bonneville Dam's fish ladders. These must be the most valuable fish in the world, in terms of public investment, so this must be the most expensive seafood buffet in history. Our investment is sea lion supper. This digestion of dollars is not insignificant. The estimates are sea lions consume up to 4 percent of the spring salmon run at Bonneville, 150 miles from the mouth of the Columbia. In some years that might be 6,000 adult salmon, which had they avoided demise would have produced millions of salmon for the next generation. Estimates are that up to 20 percent of the salmon that enter the Columbia are consumed by pinnipeds -- California sea lions, Steller sea lions and harbor seals -- a ghastly toll. Humans of course take a good share of the salmon in the lower Columbia, but those fisheries are controlled and targeted to reduce impact on salmon protected by the Endangered Species Act. The sea lions are indiscriminate. They will chow on an endangered wild spring chinook just as happily as ordinary hatchery fish. 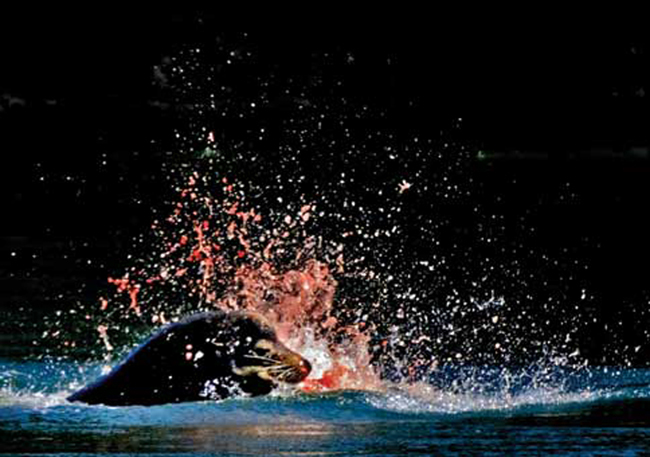 In years when salmon runs are weak, the sea lions' impact is proportionately greater, just when you need it least. Human beings with nets and poles are forbidden to do this. Sea lions have the advantage of being marine mammals protected by federal law. There were years of efforts to shoo away the sea lions without resorting to force. Loud noises, rubber bullets, and other annoyances all failed. Trapping the sea lions and sending them far, far away also didn't work. They just came back. In 2008 NOAA authorized states to kill very limited numbers of sea lions, as this was the only technique surely effective. Lethal removal went on hold when the Humane Society of the United States sued, and federal courts asked questions. A task force was appointed to study the available science, consider alternatives and makes recommendations. It voted overwhelmingly to allow lethal methods, a lone no vote coming from the Humane Society representative who contends sea lions are merely innocent victims. If killing of sea lions resumes, barring further legal impediments, states will be able to remove up to 92 sea lions, if they are identifiable and known repeat offenders. They expect to take less than half that number. Their time grows short. Sad, but we can't afford their appetites.